We’d love your help. Let us know what’s wrong with this preview of The Epistle of Polycarp to the Philippians by Polycarp. had seen Christ" (Adv. Haer., iii. 3; Euseb. Hist. Eccl., iv. 14). 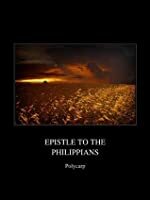 To ask other readers questions about The Epistle of Polycarp to the Philippians, please sign up. How ancient is the source document of polycarp ? It's okay. Just a ton of scriptures strung together with minimal application. Only a few things were mentioned that I thought were worthy or writing down. I have just been introduced to Polycarp so I was curious as to what his writings would look like. It is amazing to see his view of Scripture. There is no doubt that he believed the OT and NT to be the authoritative Word of God. 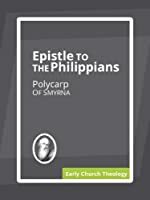 Polycarp's whole epistle is christocentric and reminds you of the writings of the Apostles. This probably has to do with the fact that he skillfully weaves Scripture through every sentence of his writing. It is beautiful! So interesting getting insight on the formation of the early church and seeing the quotes of scripture from such an early source. Polycarp has a truly pastoral way of writing. His words read as a loving father or grandfather speaking to his beloved children. I appreciate the annotations back to scripture, since Polycarp's words are interwoven with scriptural references. This is a quick easy read and his exhortations are very reminiscent of God's instructions through Paul. We serve a loving and supportive God. No matter how or when we leave this planet, God promises us heaven with Him. He always makes good on them too. This is a great but short book to read. He was truly a disciple of the Lord and if John. I watch th movie about his life. It is dry inspiring. very important letters to early Christians. it's short and most certainly worth the reading! An excellent short letter from an amazing early bishop and martyr. A straight forward letter to first century Christians. Polycarp is foundational. Knowing, then, that “God is not mocked,” we ought to walk worthy of His commandment and glory. In like manner should the deacons be blameless before the face of His righteousness, as being the servants of God and Christ, and not of men. They must not be slanderers, double-tongued, or lovers of money, but temperate in all things, compassionate, industrious, walking according to the truth of the Lord, who was the servant of all. If we please Him in this present world, we shall receive also the fut Knowing, then, that “God is not mocked,” we ought to walk worthy of His commandment and glory. In like manner should the deacons be blameless before the face of His righteousness, as being the servants of God and Christ, and not of men. They must not be slanderers, double-tongued, or lovers of money, but temperate in all things, compassionate, industrious, walking according to the truth of the Lord, who was the servant of all. If we please Him in this present world, we shall receive also the future world, according as He has promised to us that He will raise us again from the dead, and that if we live worthily of Him, “we shall also reign together with Him,” provided only we believe. In like manner, let the young men also be blameless in all things, being especially careful to preserve purity, and keeping themselves in, as with a bridle, from every kind of evil. For it is well that they should be cut off from the lusts that are in the world, since “every lust warreth against the spirit;” and “neither fornicators, nor effeminate, nor abusers of themselves with mankind, shall inherit the kingdom of God,” nor those who do things inconsistent and unbecoming. Wherefore, it is needful to abstain from all these things, being subject to the presbyters and deacons, as unto God and Christ. The virgins also must walk in a blameless and pure conscience. in all the Western and Eastern churches of his day and in the following centuries through his writings. He suffered martyrdom as an old man. Because of faithful men like him the Church has maintained the teachings of Christ and continues to promulgate the true gospel given to us by the disciples of Christ and carried forward by those of like mindedness. Probably should have already read this, but glad I finally did. Really fascinating; full of New Testament quotations validating the fact that the NT canon was received AS scripture by the church right from the get-go. Gives great confidence that we do well to stand on the 66 books of the Bible as the authoritative (and closed) canon of Scripture. 5 stars because it was written by a disciple of John, and an invaluable part of the corpus of the Early Fathers. The translation itself isn't particularly wonderful. Polycarp (Greek: Πολύκαρπος, Polýkarpos; Latin: Polycarpus; AD 69 – 155) was a 2nd-century Christian bishop of Smyrna. According to the Martyrdom of Polycarp he died a martyr, bound and burned at the stake, then stabbed when the fire failed to touch him. Polycarp is regarded as a saint and Church Father in the Eastern Orthodox, Oriental Orthodox, Roman Catholic, Anglican, and Lutheran churches. It Polycarp (Greek: Πολύκαρπος, Polýkarpos; Latin: Polycarpus; AD 69 – 155) was a 2nd-century Christian bishop of Smyrna. According to the Martyrdom of Polycarp he died a martyr, bound and burned at the stake, then stabbed when the fire failed to touch him. 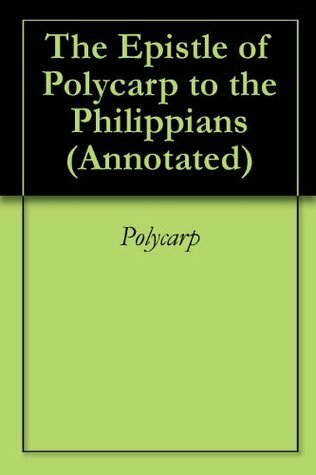 Polycarp is regarded as a saint and Church Father in the Eastern Orthodox, Oriental Orthodox, Roman Catholic, Anglican, and Lutheran churches. The early tradition that expanded upon the Martyrdom to link Polycarp in competition and contrast with John the Apostle who, though many people had tried to kill him, was not martyred but died of old age after being exiled to the island of Patmos, is embodied in the Coptic language fragmentary papyri (the "Harris fragments") dating to the 3rd to 6th centuries. Frederick Weidmann, their editor, interprets the "Harris fragments" as Smyrnan hagiography addressing Smyrna–Ephesus church rivalries, which "develops the association of Polycarp and John to a degree unwitnessed, so far as we know, either before or since". The fragments echo the Martyrology, and diverge from it. With Clement of Rome and Ignatius of Antioch, Polycarp is regarded as one of three chief Apostolic Fathers. The sole surviving work attributed to his authorship is his Letter to the Philippians; it is first recorded by Irenaeus of Lyons."